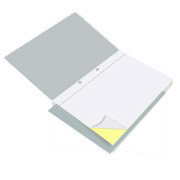 NCR Printing (Carbonless Duplicate Sheets): Invoices, Receipts, Time Sheets, Delivery Notes and other business documents where duplication is required. 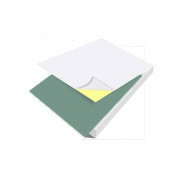 There are various colours of NCR paper available such as white/yellow/pink/green/blue, in most instances white is the top copy and subsequent colours are beneath dependant on the number of duplicated pages required. For example; If you require 2 copies of a document being written/printed, you would have a white top part and one coloured second part below, this is called 2 Part. 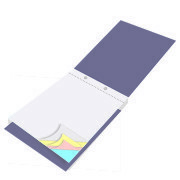 For 3 copies, you would have a white top part and 2 coloured parts below, this is called 3 Part. For 4 copies, you would have a white top part and 3 coloured parts below, this is called 4 Part. 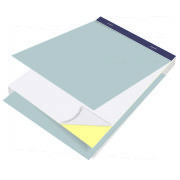 Our NCR is available in a variety of sizes: A4,A5, A6 & DL in 2part, 3part & 4part sets With the options of continous numbering, perforation & holes drilled and supplied in pads (glued), Books (stapled and perforated top copies) or loose sets. Most NCR is printed mono but colour is available. A full design service is available, so you can get that professional look you require.